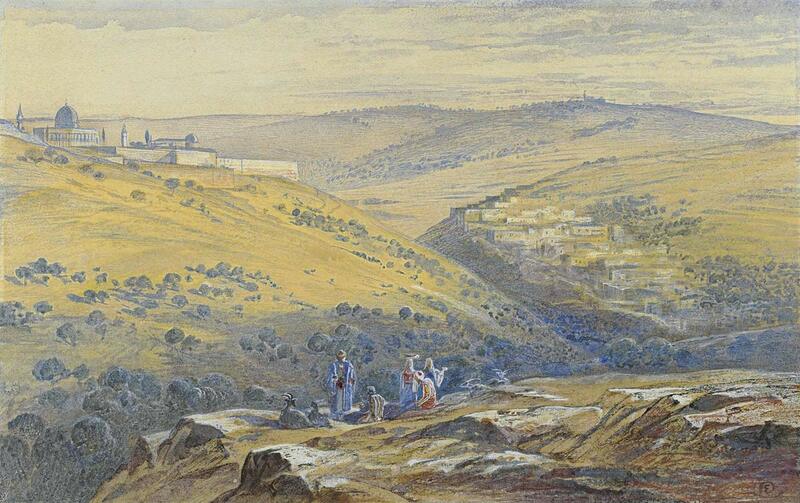 Edward Lear, Jerusalem; a view from the South looking towards the Dome of the Rock. Signed with monogram (lower right). Pencil and watercolour and bodycolour heightened with white. 6 3/8 x 10¼ in. (16.2 x 26 cm.). Lear first visited Jerusalem in the Spring of 1858 arriving in Holy Week, having been commissioned to paint the city by Lady Waldegrave (1821-1879). He went out each morning making preparatory drawings and wrote to his sister Ann ‘… just before sunrise the view of the city is most lovely, all gold and white beyond the dark fig and olive trees’. Lear returned to Jerusalem in 1867 setting off on camels across the desert, eventually arriving in Jerusalem in mid-April. This entry was posted in Edward Lear and tagged Edward Lear, Palestine, travel, watercolours. Bookmark the permalink.